The final moments of Pakistan’s last Test of the 2017 tour of the West Indies will be etched in many minds as they marked the last time the two stalwarts of Pakistan cricket, Misbah-ul-Haq and Younis Khan were seen in an international match for Pakistan. It was largely felt that Pakistan would struggle immensely without the services of the two master technicians who had been the backbone of their side’s batting for many years. And for a while, especially after the stinging 2-0 Test series whitewash against Sri Lanka, it appeared that the forecast of tough times ahead especially in Tests could become a reality. However, the Pakistan Test side’s performance on the tour of Ireland and England seems to be a harbinger of better times ahead. The feel-good factor and the positivity gushing out from the recent performances by Sarfaraz Ahmed’s men across all formats has won great admiration from all quarters, and especially from the former Pakistan captain Misbah-ul-Haq who in an exclusive interview with PakPassion.net showered praise on the new-look Pakistan side. Pakistan’s success in the Champions Trophy was one that suddenly made the world of cricket sit up and take notice of a side which in the recent past had promised much but largely failed to deliver. For the former Pakistan captain, the new-found confidence of this young Pakistan team is nothing but a direct benefit of the Pakistan Super League. There is little doubt about the fact that any side which possesses talented players such as Shadab Khan or Faheem Ashraf has the right to feel confident for its future and in the experienced eyes of Misbah-ul-Haq, it is simply the exuberance of youth which is making a huge difference to Pakistan’s fortunes in international cricket. Pakistan’s recent tour of Zimbabwe was a satisfactory one for the manner in which the side executed their game-plans in a ruthless manner, disposing of Australia and Zimbabwe in the T20I tri-series and then going on to decimate the hosts in the ODI series. Along the way, Pakistan’s new crop of players showed exactly why they are regarded so highly in international cricket. To those including Misbah-ul-Haq who saw Fakhar Zaman’s brilliance during this series, it was clear that the left-hander brings something special to the Pakistan team, perhaps something they have not had since the days of Saeed Anwar. With 333 international appearances to his name where he has scored 11,224 runs for Pakistan, 37-year-old Mohammad Hafeez has been a bed-rock of Pakistan sides for many years. His exclusion from the Pakistan team which played the ODIs in Zimbabwe surprised many, including his previous captain Misbah-ul-Haq. With England and India now involved in an enthralling battle for supremacy in the ongoing 5-match Test series, the performance of one of the world’s top batsmen Virat Kohli will be watched as a matter of great interest. To a batsman like Misbah-ul-Haq who was once considered the pillar of stability for his side, there is little doubt about what Virat Kohli brings to his side and to international cricket as a whole. Whilst Virat Kohli’s success on the field appears to be intertwined with his team’s fortunes, it would also be fair to say that India do possess enough talent which England may find difficult to counter in the ongoing Test series. The likes of James Anderson and Stuart Broad may well be big names in cricket, but the fact is that they will be facing a much younger Indian side during this series. To Misbah-ul-Haq, however, it's more about the current form of the sides rather than age that will have a bigger say in the final outcome of this Test series. Whilst England may well enjoy superiority due to playing on their home-turf, it is also true that ICC’s top-ranked Test team visiting the shores of the United Kingdom is quite easily capable of holding their own and springing a few surprises on the hosts. To Misbah-ul-Haq who lead his team on the tour of England in 2016, India’s recent results and their talent are perfect recipes for a victorious tour of England, “I think it will be good competition between two excellent sides. In India’s case, if one looks at the way they played against South Africa in the Test series, it is clear that this is not the same sort of weak Indian team which has visited England in the past. Whilst England may have home advantage, we know that some of their top batsmen have been struggling which makes me think that India have a very good chance to win this series,” he concluded. Last edited by Abdullah719; 4th August 2018 at 00:06. The only place for Hafeez is OUT of team Pakistan. Misbah you carried so called seniors hafeez, afridi, zulfiqar. Kept playing shezad and akmal. Misbah should realize we have made some progress by moving on, hafeez clearly doesnt merit a place anymore. One of the best captains Pakistan has ever had; He needs to be involved in Pakistan Cricket asap by the PCB. Former Pakistan captain Misbahul Haq is of the opinion that Pakistan Super League (PSL) has played a key role in the rise of young cricketers. Misbah — who scored over 11,000 international runs for Pakistan — believes featuring alongside leading cricketers has helped immensely in development of young players in the country. The 44-year-old added that the gap between domestic cricket and international cricket — in terms of exposure — has been bridged significantly after three editions of PSL. Misbah also pointed out that the change in morale and body language of the side — due to the exuberance of youth — is playing a pivotal role in the team’s success and hoped that the same trend will continue in the future. 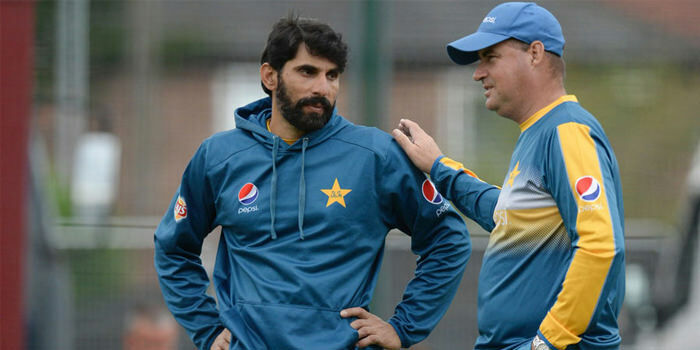 Misbah further went on to praise head coach Mickey Arthur for taking stiff decisions for the sake of Pakistan cricket which have reaped rewards in shape of better fitness levels and a well-disciplined side. Mohammad Hafeez — who has represented Pakistan in 50 Tests, 200 ODIs and 83 T20Is, where he scored 11,224 runs and claimed 239 wickets — was snubbed from the side for the recently concluded five-match ODI series against Zimbabwe and speaking on the issue, Misbah said that this situation must be very difficult for veteran all-rounder and believes it now up to Arthur, captain Sarfraz Ahmed and team management to make a call on his future. No he should be kept away from PCB as far as possible. YES men like him are the reason behind PCB's failures. You were one of those decisions. Hoping that he is the future Chairman of the PCB, educated and has played cricket. He may be a decent and educated man but he is not fit for the role of administration. He lacks conviction and courage which was evident from his tenure as captain. He is a great man-manager and should instead focus on developing the next set of rudimentary young batsman. Sharjeel debuted and played under Misbah, why wasn't he affected by Misbah's play slow mentality? Credit to Misbah who actually introduced most of our new players. Shadab, Talat, Sharjeel, another couple of players I'm forgetting. Sharjeel never got consistent chances under Misbah. They were introduced by PSL and A team performances. A very respectable captain but has always had a preference for giving first chances to players who were at the ripe age of 29-31. There was a steady decline in our ODI cricket under Misbah and this was due to him changing our style of play, it was like watching Arsenal play like Chelsea (parking the bus) and it did not suit us. We relied too much on trying to bowl all 50 overs when bowling second to win games with at least 4 spinners and we've lost too many games that we should've went on to win. Young talented players are the way forward. The Hafeez scenario is an interesting one. In Pakistan cricket over the years there has been a loyalty towards senior players who have been around for a number of years. However Mickey is trying to remove that culture - let's see how this goes. At the moment Mickey is putting his foot down and it's working. Please no. I am quite enjoying watching these youngsters. Arthur has been a breath of fresh air. No baggage, no affiliation to any players. He's doing a fantastic job and long may it continue. True and that's why PCB need to extend his contract asap. But its different this time. Hafeez is more of consistent batter and he can also bowl. Among the new bunch of all-rounders, no one is ready to take the crown off from him. I think Mickey will be compromising in this case unless he stops performing (like in recent times). Arthur has emotionally invested too much in Pakistan cricket to go for another job any time soon. I have seen few coaches care as much as Arthur does. I think he will happily stick around for years. Kept it diplomatic in regards to his response with Hafeez's exclusion, but we all know if it was him who was captain today, Hafeez would have been given free ride under his leadership. Misbah made a mess of the ODI team alongside with Waqar Younis and it would have spelled further disaster if he was made to be PCB Chairman or even a cricket administrator despite holding a MBA because he isn't a courageous leader but merely a "yes man". On the positive side it's good to see him give M.Arthur credit he's due unlike the some of our bitter old ex players like Miandad & Qadir, and liked how he recognised PSL has reduced the gap between domestic limited overs cricket and LOIs. In addition it was nice of him to acknowledge Pandya which will be a slap in the face to his armchair critics on PP. Last edited by topspin; 29th August 2018 at 00:26. I hope you're right but what if say BCCI (who I can see removing Shashtri) come up with a big offer - say at least triple the salary offered. Of course everyone has a price, but BCCI would not pay over the top for a head coach. Kohli calls the shots and they would not want a coach who could be in conflict with him. I think the next coach would be Dravid, and there is enough mutual respect between the two for the ship to sail smoothly. Mickey is making an example of Hafeez and showing the other players that if you play with fire your fingers can get burnt. All times are GMT 5.5. The time now is 22:12.